Let me start by saying, shooters are not my thing. There have been a handful of shooters in the past that I quite enjoyed, but every one of them has some secondary function which does it for me. In Borderlands it's the RPG elements. In Uncharted it's the characters, the pacing and the polish. 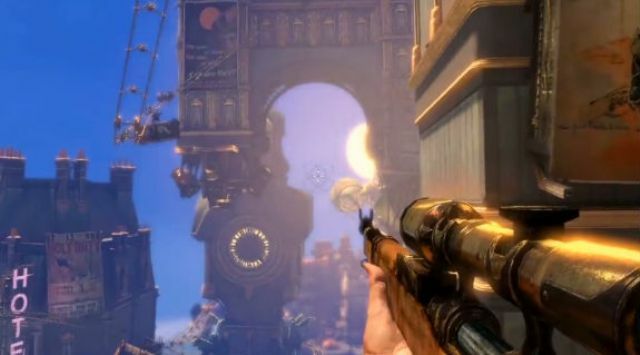 On the short list of shooters I have enjoyed, Bioshock sits right at the top. I didn't like it at first, but I kept going because it's reputation. Before I knew it I was enthralled in this astounding world with an amazing atmosphere and narrative that just wouldn't let go. With that said, I was still a little wary of picking up Bioshock Infinite right away. I didn't follow it's development too closely, and it's still a shooter. The thing is, atmosphere and narrative just aren't things you can really get a sense of unless you are playing the game yourself. However, Steam managed to trick me into buying the game, and so regardless I am here today, having beat the game, to give my impressions. Once again, Bioshock Infinite proved to be a title that took a while to really get going. I had heard all about this companion Elizabeth, who was supposed to be at the very core of this game. Yet, it took me a good 3 hours to even meet her. That's 1/4 of my total play time. Of course I spent those 3 hours doing other things, and in many ways it made me yearn for the Bioshock of old. lMost of the same concepts return, but are noticeably streamlined. You have access to several abilities (now called vigors), but there isn't much by way of environmental uses for them, and in combat they are mostly just used to stun an enemy or set a trap. 98% of the time it's much easier to just shoot the guy anyways, unless it's one of the "heavy hitters". It's not like normal enemies can do much to you anyways, thanks to the new regenerating shield system. Shooting in itself is dumbed down too, though. You no longer have access to all your guns, instead going for the groanworthy 2 gun system. You can still upgrade your weapons, but the upgrades seem less interesting and whimsical than the crazy pipes and tubes you tweak your arsenal with in previous games. Plus, what good is it to upgrade your Pistol if your enemies are all going to use shotguns and machine guns? You're kind of forced to also use those weapons. You can can customize your abilities a bit still, through the use of... clothing? Not only does the clothing seem to conspicuously lack a narrative explanation (not something you expect from Bioshock), but it's also kind of boring. With so few gameplay options remaining, the number of things clothing can augment is left pretty lacking. For some reason they seem to fixate a lot on skyline abilities, which I found aren't that plentiful, and even then aren't particularly useful. Ultimately it just seemed to me like the gameplay was purposefully downplayed. My assumption is this is done to keep things simple for the dudebros, and allow players who are looking for a little bit more to focus on everything else in the game. Thankfully, that is where this game delivers, in spades no less. Immediately upon arriving in Columbia, I was struck by just how different it was from Rapture. Despite knowing it was a city in the sky instead of being underwater, I somehow expected it to feel the same, but I was very wrong. Rapture felt like a very secluded, lonely place. It was just you and the mutant splicers sitting at the bottom of the ocean. Columbia feels vibrant, alive and open. The city is very much intact, full of color, interesting people, and actual character interactions. Even just the feeling of looking out and seeing the clouds adds a much lighter tone to the game. I especially liked how lively the game felt. Columbia is chock full of people, and they all have an interesting story behind them, even if you have to infer it based on what you can see. It's kind of unfortunate that by the end, the scene changes so much. As the action picks up the people get less frequent, more of them want you dead, and the locales are more run down. I suppose it's necessary to create that contrast, to make the later parts of the game feel more dire. Early on Columbia felt like such a unique and fun place though, I can't help but wish I could have had more of that. Thankfully though, random strangers strewn about the streets of Columbia aren't the only humans you have to interact with. In fact, your player character even has an actual personality now, too. At first I thought it was kind of odd, considering the game never shifts from first person perspective. It felt odd having this voice that was not my own emanating from my character. It didn't help that in the start, Booker DeWitt is basically just a bitter, cynical, emotionally scarred killing machine. He isn't especially interesting, but the way the game leaves out so much information makes you want to learn more, about your character, about this place, and about this girl you are supposed to be finding. Then you find her, and the entire game flips on it's head. 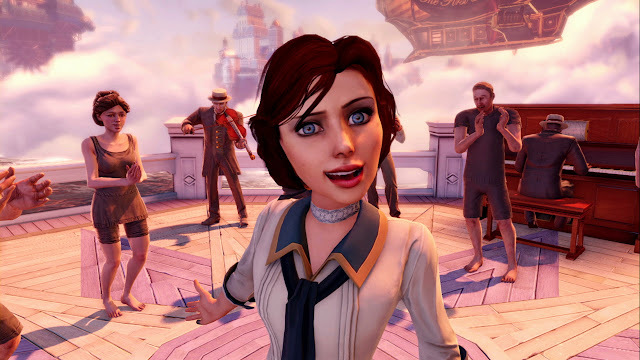 Elizabeth is Bioshock Infinite. 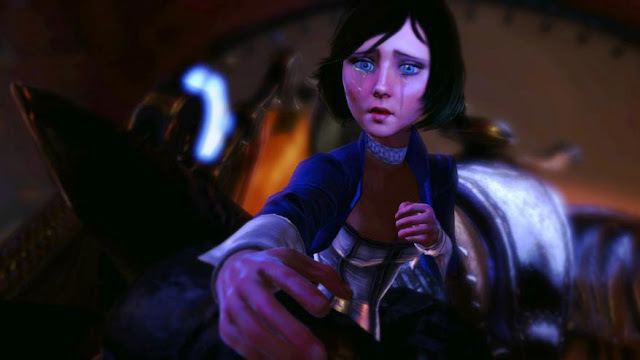 Booker becomes attached to her, the two characters have good chemistry, and the interaction between the two characters excuses any monotony the first few hours may have held. It's just so hard not to be enthralled by Elizabeth. She is beautifully realized, and easily the most human character I have ever seen in a video game. Her animations are lifelike, her voice is very well done, she is well written, and she's just really easy to like. She undergoes a surprising amount of growth, too. People are calling her a Disney Princess, and I think it's a pretty suiting moniker. As for the game's actual plot itself, it's a really striking, memorable ordeal. As things start out, everything seems pretty mundane, and I actually thought it was kind of "meh". Columbia is an amazing place, but Zachary Comstock and his ideals are nowhere near as interesting as Andrew Ryan. What I will say though, is that Bioshock Infinite definitely made me think. It's big schtick is the fact that Columbia is an idealistic 1920s city of aristocrats, and as such is full of racists. There is a moment soon after finding Elizabeth that I found very poignant, wherein she innocently asks Booker why the blacks have to use a different bathroom, and he simply replies "that's just how it is". The game doesn't pull any punches in putting these injustices on display. It's shocking, but for the sake of clarity I wouldn't say the game is in itself racist, so much as portraying it's inhabitants as racist. The theme is pretty prevalent throughout the game, and at times actually felt kind of uncomfortable. I don't feel qualified to speak to the themes themselves, but if nothing else I think it's good that the game did such a good job of provoking thought and discussion on the issue. 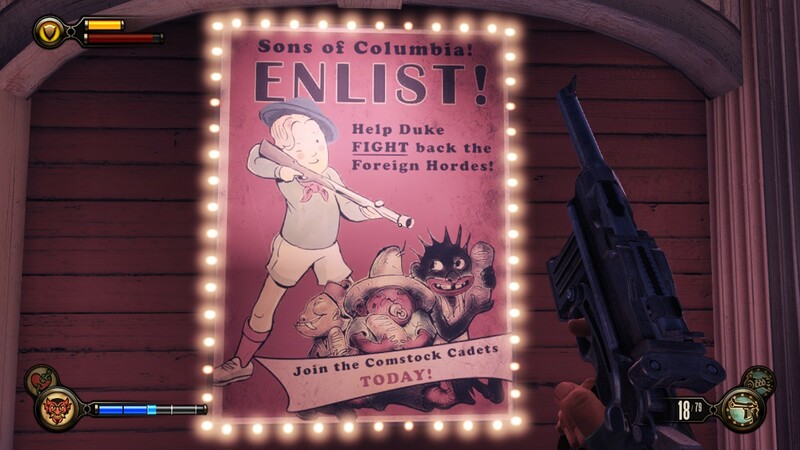 Racist themes aside, Bioshock Infinite has a very strange plot. As I said, it starts off very mundane, though it ramps up pretty quickly once you find Elizabeth. For a time it actually feels things are going too fast. It seems like things are happening right and left, and yet you aren't actually learning anything new, stuff is just happening. I also felt like Booker's relationship with Elizabeth was kind of all over the place early on. She seems to rapidly go back in forth between trusting him implicitly and not at all. Everything kind of comes to a point after a dramatic scene on an airship. The action slows right down, you find yourself on what is essentially a drawn out fetch quest that overstays it's welcome. Then out of the blue the story takes a complete turn, the action is all uphill from there, but nothing makes any sense any more. Ever. Things get very strange very fast, and they don't go back. The adrenaline starts pumping, serious business time is a go, and it's a very intense sprint to the end, in more ways than one. There are some exceptionally emotional scenes that take place here. Then comes the ending. On one hand, it's extremely bold, very abstract, and about as weird as everything leading up to it. Part of me wants to say it's amazing and excuses every slow moment, gameplay imperfections and plot oddities leading up to it. Part of me wants to say it's terrible and just way too strange to really be that enjoyable. Ultimately I think after a few days of thinking about it, I'm leaning more towards the first though. If nothing else, it's an ending that promotes a lot of thought and discussion. That on it's own is a major victory. Either way, it's a huge brain twister, and it deserves a ton of respect for tying the narrative of the game together so well, especially when parts of it seemed so spotty prior. I used the word memorable earlier and the ending is most definitely that. I would argue it's even more memorable than the famous Bioshock twist, even if it is way more abstract and confusing. 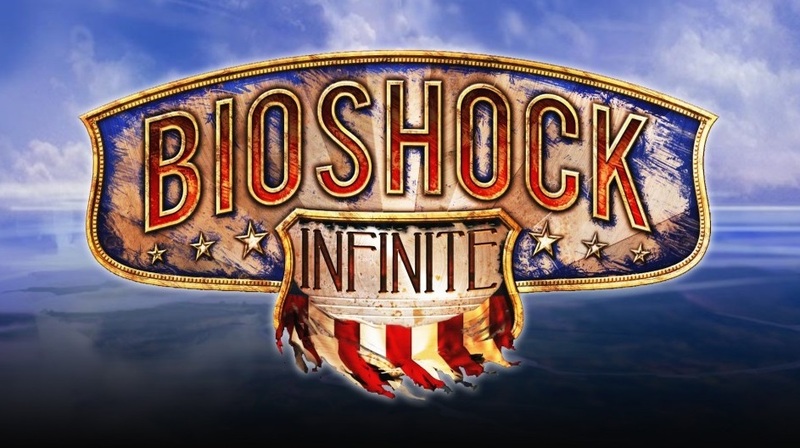 All in all, Bioshock Infinite is unquestionably an outstanding game. Granted it's gameplay is no great shakes, but in truth that's not what I play Bioshock for. I wanted atmosphere and I got it. It's not Rapture, but Columbia is an extremely interesting place in it's own right. If you are looking for a good mindless shooter, Infinite may not be for you. If you are looking for a thought provoking game with some intense social commentary and deeply emotional moments, then you owe it to yourself to play this game. 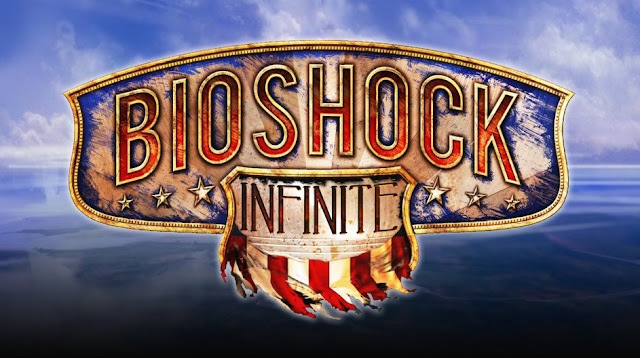 In truth, I think Bioshock Infinite deserves a spot right next to it's older brother on the list of games every gamer should play. Elizabeth is the standard by which all characters will now be held to. This is her tale in more ways than one. I will truly miss spending time with her, which is strange to say about a digital character, but damn it man, the feels!